This is a character generator for a variety of role playing games. It is compatible with Star wars, Cyberpunk, Advanced Dungeons and Dragons, Alternity, Rolemaster, In Nomine Satanis Magna veritas,D20 Modern and Star wars D20. 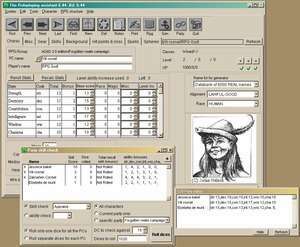 D20 RPG Assistant 7.13c is a shareware program and can be used as a demo to try the software until the free trial period has ended. A full version of the program is available after the trial period ends. For security reasons, you should also check out the D20 RPG Assistant download at LO4D.com which includes virus and malware tests. Additional screenshots of this application download may be available, too.